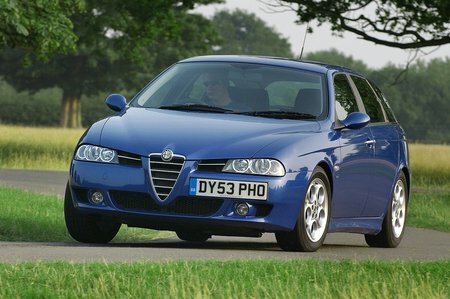 Which used Alfa Romeo 156 estate should I buy? Avoid the weedy 1.6-litre petrol; the 1.8 is a much better bet and produces the sporty snarl that Alfa Romeo enthusiasts expect, while the direct-injection 2.0 JTS provides more punch for not much more money. For even more pace, there's the 192bhp 2.5 V6 and range-topping 3.2 V6 GTA. The latter is an all-out performance model, and comes with a six-speed manual or five-speed Selespeed paddleshift gearbox. The best balance between punch and economy is the 2.4 JTD turbodiesel. It's as quick as the 1.8 petrol, but should return around 10mpg more and holds on to its value better, too. Because every 156 is very well equipped, we'd stick with the base Turismo trim. Pick a Lusso model to gain a CD player and leather seats, or move up to Veloce if you like your Alfa a bit more butch: sports suspension, side skirts and Recaro sports seats are fitted.